In 1980, Jack brought in former President Gerald Ford as the Keynote Speaker for the Pacific International Hospitality Show. 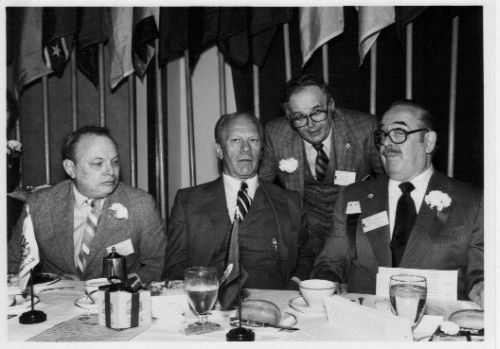 A PORTION OF THE HEAD table are from left to right National Restaurant Association President Bob Power of the Nut Tree Restaurant, Vacaville, California, President Ford, Jack Gordon, and RASW's perennial Convention Chairman Victor Rosellini. It's a good thing that there were several levels of head tables. 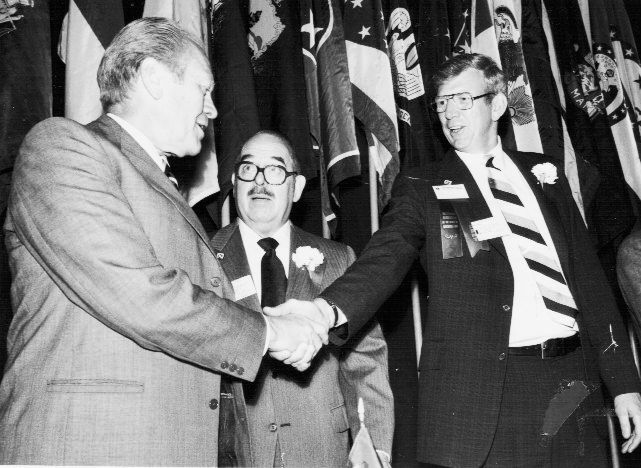 Here's President Gerald Ford during his 1980 visit to the Restaurant Convention, shaking hands with Restaurant Association President Bruce Attebery along with a benevolent Victor Rosellini looking on.